(Images Moonshine [l] x Silver Filigree [m-phf]-Silver Drift) Sire is a few spot leopard tracing to Patchy, Bambi E and Joker B. Dam is a purebred Arabian mare from Persimmon Hill with Crabbet and *Bask (Polish) lines. Dam of Silver Jackpot, 97, o/b Holly Uziak; Champion Sure Sterling, 98, o/b PHF and Captivator, 02, o/b PHF. (Maestro del Mundo [m-phf] x Diademme [m-phf]- PHF Silverdrift [m-phf]) Sire is one of our Champion Andalusian stallions, with lines to Jenson, Legionario III, Capitano, Talayote, Egoista IV, Baratero IX. Dam is a CMK/Babson Arabian mare. Breyer porcelain LE 'Esprit' OF. (Viento Invierno PhD [m-phf] x Baha Royale [m-phf]- Royal Bahade [m-phf]) Sire is an Andalusian linebred to Ganador VIII. Also Poseido III, Taco Taco, Agente, Maluso, Dominante. 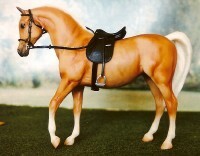 Dam is a CMK Arabian mare linebred to Abu Farwa. MEPSA Reserve Champion breed 2014. Dam of Balduino, 10, o/b Autumn Rupert and Joyas de Ambar, 14, o/b PHF. (Sun Hawk [m-starhold] x PHF Fatana [m-phf] JK Spartan [l]) Sire is Daralyn Wallace's multiple National (NAN) Live show Top Ten Hagen Renaker Morab stallion. His Arabian lines are to Lewisfield Sun God, Ibn Hanrah and Hanad. His Morgan lines are to the palomino western horse, Californio, and also to Devan horses. Phaeton's dam has lines to *Bask and *Eukaliptus. Animal Artistry large striking Arabian, finished by Marion Keefe of England. Sire of Laibah, o/b Randa Garrett and MMR Sunhawks Mirage, o/b Debbie Teeselink. (Foxfire Rainmaker+ [m-d.metcalf] X Foxfire Skylark [m-d.metcalf]- Storm Warning) Lines to Abu Farwa, Indraff, Aurab, Muscat, Fadjor, Orcland Ambassador. Dam of Laibah, 00, o/b Randa Garrett. (Ben Aura [m-phf] x Marigold PhD [m-phf]- Delphi Adonis [m-phf]) 3/4 Arabian. Aurab lines through sire. Padron lines through dam. HR large vintage Zara in palomino. Dam of Alstroemeria 05, o/b PHF and Felarof, 08, o/b Cory Hartung. 2008 IPABRA OF Reserve National Champion Mare. CHAMPION. 2008/09 MEPSA winner. (Pure Gold [m-s.feld] x Bint Stormeyn [m-s.feld]- *El Minyat [m-a/willis]) 7/8 Arabian, 1/8 ASB. Sire of multiple Champion Foxfire Eve+. MEPSA qualified 2014. Sire of Reserve Champion, Beys Emerald, o/b PHF. Stone 1 of 5 'Anschutz' FCM OF. (Harlem Globetrotter [l] ASB x Bay-Mirage [m-phf] Arab- Bay-Abi [l]) Sire is an outstanding ASB sire, who got Champions and winners in 5 gaited, 3 gaited and harness. Dam is a Bay-Abi/Raffon cross. Will take a *Bask line stallion very well! Rhodes resin 'Bahira' by artist. Dam of Perfect Pandemoniumm, NSH, 93, o/b Alicia Schafroth. Years open: 91,92,94,95,96,97,98,99,00,01,02,03,04,on. Only ASB, Arabian and NSH sires accepted. (Khriptonite [m-pend-j/hoppenrath] x Unrequited [m-pend-j/hoppenrath]- ) 3/4 Arabian, 1/4 ASB. Available to Arabian, ASB or NSH stallions. Dam of Sundancer, 03, o/b Kristen Birch.